BlueSeas Contact Us Page Let Us Know or Tell Us! What’s On Your Mind? While some of the older methods of communications can be still be used, it often takes quite a while for us to get the word. 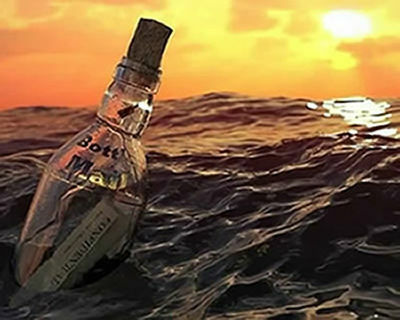 We generally recommend against the message-in-a-bottle method shown, but know that we are keeping an eye out anyway just in case. For what it’s worth, we have found that email is generally quick and effective and is probably the best method to reach us. Regular mail (snail-mail) is another option to reach us and while not as slow as the message-in-a-bottle, it too is far from timely. As a last resort, you can always give us a phone call, but, be warned: We are not always hanging around the office. We spend a large portion of our time out on the water. . . "On the lookout for those bottles of course!" Your comments, questions, and suggestions regarding our site and its content are truly important to us. With your help, we can improve the Blueseas’ website as a resource for the boating community. We encourage you to contact us at: . Your e-mails will be answered as quickly as possible.